There are more questions about solving common litter box problems than any other cat behavior complaint. Young kittens don’t automatically know where to “go,” and you’ll need to teach them potty etiquette. Adult cats may understand the basics, but certain habitat or health conditions could prompt them to avoid their usual facilities. Why Do Cats Have Litter Box Problems? Most of the time, your cat isn't using its litter box for a behavioral reason; either it's annoyed or stressed about something. There are also medical reasons it may be unwilling or unable to use its litter box, however, so as soon as you notice changes in box behavior, take your cat to the vet for an exam. Diabetes and kidney disease increase the amount of urine produced, and an affected cat may not be able to get to the box in time. An arthritic cat could have difficulty with stairs or trouble climbing into a high-sided litter box. Painful urination caused by lower urinary tract disorders may prevent a cat from successfully using the litter box. Elimination-related ailments, such as constipation or diarrhea, that are unpleasant for the cat might make it avoid its box. Painful paws that make it uncomfortable to walk on litter can be an issue. Dementia in older cats may make them forget where the litter box is or even how to use it properly if they find it. Very old cats sometimes forget their training if they develop kitty Alzheimer's. A cat suffering from separation anxiety may stop using its box, and it can take a cat up to two weeks or longer to adjust to a new routine. If you're gone for an extended period, you're going to smell different to your cat when you return, which may also upset your kitty's toilet habits. A kitty that's stressed out may temporarily stop using its box after a big event like a move to a new house, family members moving in or out, or the arrival or departure of other household pets. A bored or sedentary kitty may have litter box issues, so give your cat plenty of toys and daily playtime and exercise to stave off boredom, another source of kitty stress. Cats appreciate a clean toilet and tend to look for other places to empty themselves when confronted by a full litter box. A cat’s sense of smell is many times more acute than your own. Even a mild odor can be off-putting to your pet, so keep the litter box clean and change the litter frequently. 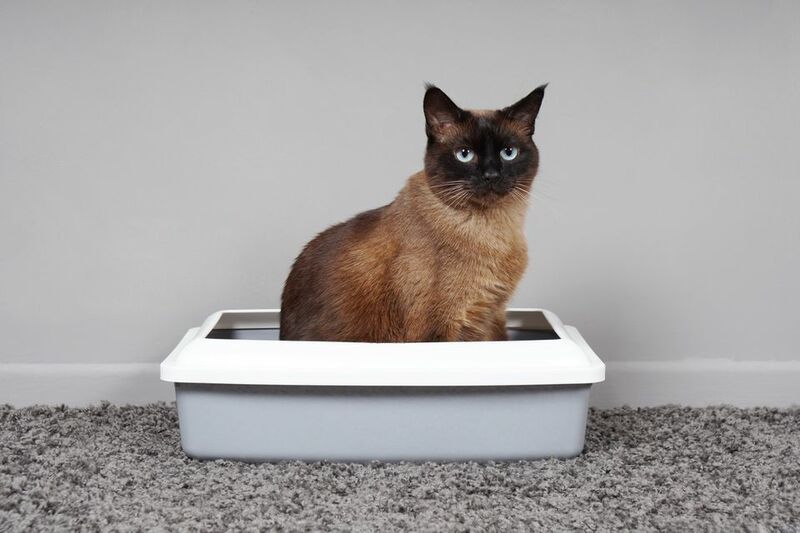 Your cat wants privacy, so place its litter box in a low-traffic area with the least amount of disturbance. Think about the location from a cat's-eye view as well. Do the kids and dog have access to this area? Unwelcome visits and obnoxious noises can send your cat to more private places. Your cat also doesn't want to eliminate close to its bed and food bowl. Kittens and small cats don’t care about the size of the box, but if your feline is big boned, it may need a supersized toilet. Cats prefer litter boxes at least 1 1/2 times longer than their bodies. Bigger cats may hang over the edge of a standard-size box. At other times, a bigger cat may hit the mark but doesn’t want to stand on top of its deposit to cover it up. These frustrated cats may scratch the outside of the box. Many cat lovers have more than one cat. If you've noticed litter box fussiness in one or more of your cats, you should have one litter box for each cat, plus one extra. While small kittens often share a litter box with no issues, adult cats may quarrel over this very important real estate. One cat in the household may actually take ownership of the box and try to prevent the others from using it. Be sure that the multiple boxes are in different rooms or on separate floors, so they can’t be guarded by one determined cat. Even singleton cats may require more than one box because some prefer one toilet for liquids and another for solid waste. To maintain litter box allegiance, pay attention to the litter your cat likes. Once you find that brand, don’t switch. Like other cats, your cat loves the status quo, and any change in its litter box substrate could prompt it to snub the box. The best litter absorbs moisture, contains waste and odor, and suits the cat. If you have a particular product preference, you can start indoctrinating during kittenhood. But adult cats have their own ideas, and you won’t win the battle. If, however, you've tried everything and eliminated other possible causes for your cat's litter box problems, switching the litter might be the way to go. Is your cat going on linoleum, wood, paper, carpet, or cloth? Try less litter or even an empty box or line the box with paper, add a carpet remnant, or try adding an old hand towel. The idea is to pay attention to the surface your cat likes to use and try to duplicate it in the box to help your cat reestablish good litter box habits. Why Is My Cat Eating Litter? Why Is Your Cat Not Covering His Poop?